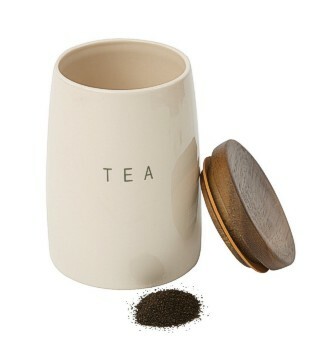 This attractive cream coloured ceramic storage jar is a great accessory for the kitchen. The practical and minimal 1950's style retro design will keep its contents fresh for ages because of the push fit lid and air tight seal. The lid is made from solid acacia hardwood and each jar is neatly labelled with capital letter graphics. It is 15 cm high by 12 cm in diameter (6 by 4¾ inches approx). There are eight jars available in the set:- Bread, Biscuits,Tea, Coffee, Sugar, Rice, Pasta and a Mini Jar.